A man who died after being restrained by police was unlawfully killed, an inquest jury has decided. 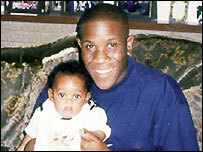 Roger Sylvester, 30, died after being detained by eight police officers outside his home on 11 January 1999. He was taken to hospital where he fell into a coma while still being restrained by up to six officers, and died a week later. position, and was not given sufficient medical attention. The verdict was greeted with cheers from friends, family and campaigners who packed the court. They said afterwards they were considering whether to bring a civil prosecution, but hoped the Crown Prosecution Service would review its decision not to bring charges against any of the eight officers involved. The Metropolitan Police said it was "naturally disappointed" with the verdict, but took Mr Sylvester's death "extremely seriously". It added it was working on ways to reduce deaths in custody. Mr Sylvester had suffered from mental health and drug problems, and was detained naked and banging on his own front door in Tottenham, north London. Police detained the struggling man under the Mental Health Act and took him to an emergency psychiatric ward at St Anne's Hospital, Haringey, where he stopped breathing while under restraint. He never recovered, and died seven days later in London's Whittington Hospital. Pathologists at the inquest were unable to agree on the cause of death. But the jury found Mr Sylvester died from brain damage and cardiac arrest, triggered and exacerbated by breathing problems which occurred during the restraint, and also cannabis-induced delirium. The jury foreman said three points paid "a significant contribution to the adverse consequences of restraint". "One - held in restraint position too long. Two - lack of medical attention. Three - no attempt was made to alter his position of restraint." It was argued during the inquest at London's St Pancras Coroner's Court that he was restrained on his stomach, which increases the risk of suffocation. The officers denied the allegation, saying Mr Sylvester had been kept on his side in line with police restraint guidelines. A statement by the eight officers involved said after the inquest: "Their treatment of Mr Sylvester was motivated only by a desire to secure immediate medical intervention. "This decision is likely to be the subject of further judicial proceedings." All the officers are back at work and no disciplinary action has been taken against them. Mr Sylvester's mother Sheila, 68, a retired nurse, said: "I'm very pleased at how it went today. I thank God and thank the campaign. It has been four years and nine months of hard work. "We have had a lot to put up with and I have a lot to think about now." David Lammy, Labour MP for Tottenham, who backed the Sylvester family throughout their four-year campaign for an inquest, welcomed the verdict. "Justice has now been delivered and some serious questions must now be asked of the police officers involved," he said. "I will be supporting the family as they consider their next steps." The jury took two hours to reach a unanimous verdict after the month-long inquest. Commander Phillip Hagon of the Metropolitan Police said: "We wish to reassure the family that the MPS has taken Mr Sylvester's death extremely seriously. "We have endeavoured to listen to the family's concerns as well as the concerns of the wider community. "We understand that this verdict may result in further inquiries and we will make every effort to assist with those inquires." The Met had been taking various steps to try to reduce the number of deaths in custody, he said. This included installing CCTV in cells, training custody sergeants, and continuing to work with "partner agencies and medical experts" to ensure appropriate treatment for people in custody.